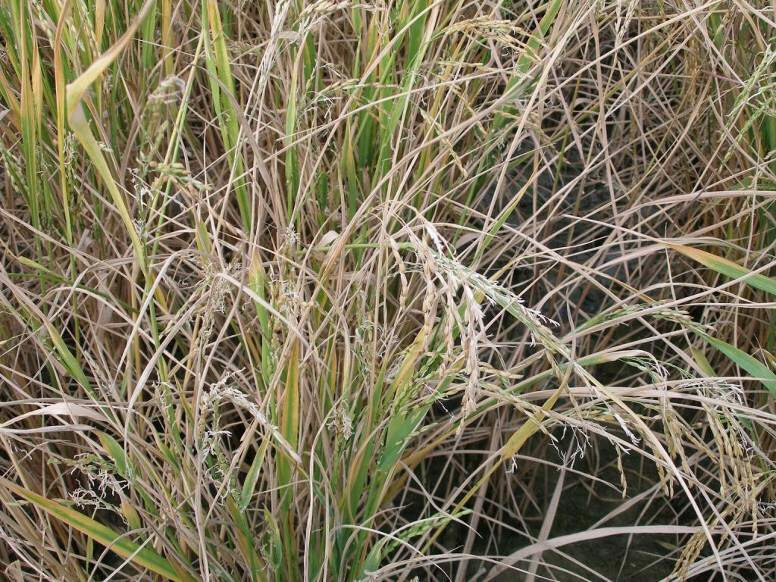 Review the progress in rice breeding for saline and problem soils including the development of screening techniques. 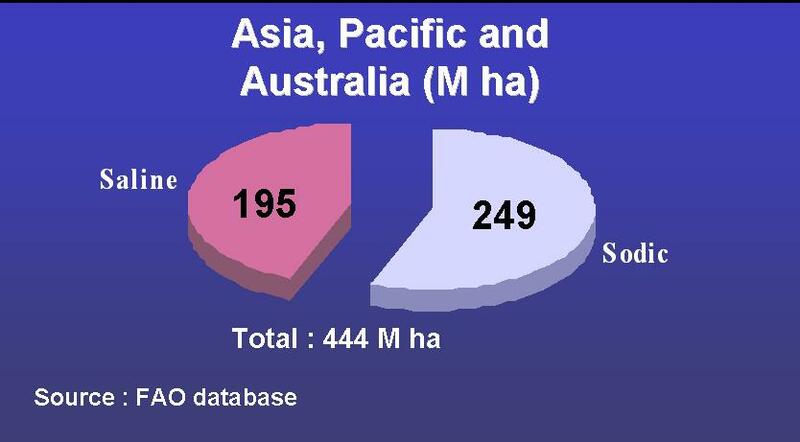 Millions of hectares in the humid regions of South and Southeast Asia are technically suited for rice production but are left uncultivated or are grown with very low yields because of salinity and problem soils. Furthermore, mineral deficiencies and toxicities compound the problem of salinity as it seldom happens in isolation. These soil stresses vary in magnitude and interactions over time and place, making long-term adaptability of a variety dependent on its level of tolerance to all the stresses that occur in its growing environment. 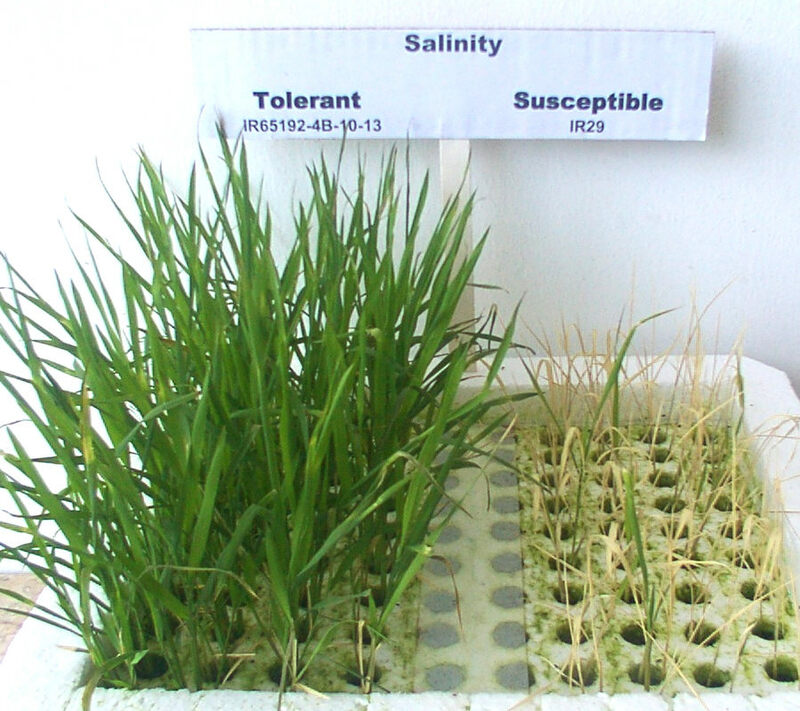 Thus, in breeding rice for saline environments, multiple stress tolerance traits must be considered. Some degree of varietal tolerance for these stresses is present in rice germplasm. However, understanding the physiological mechanisms of these traits, of their biochemical basis, inheritance and efficient screening techniques are needed to hasten breeding progress. 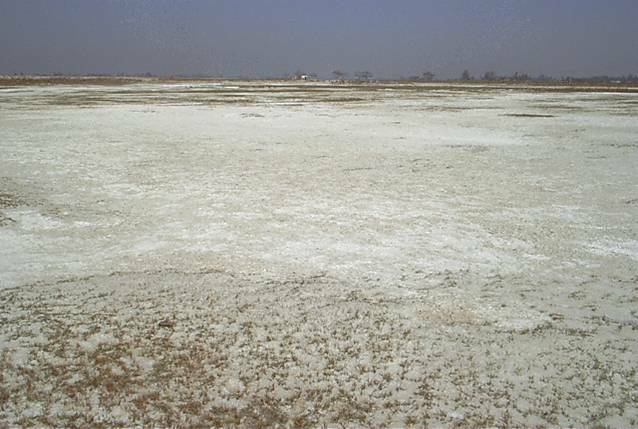 The challenge is to develop high-yielding, salt-tolerant cultivars for the various salt-affected areas of Asia. The tools of biotechnology (specifically, molecular marker-aided selection [MAS] and genetic engineering) offer a promise to complement existing breeding strategies. 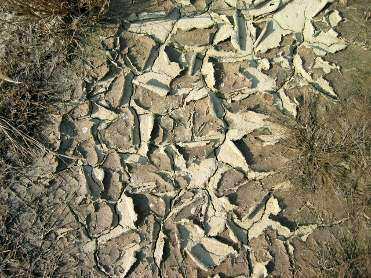 --> Occurs in arid regions, estuaries, and coastal fringes. Saline soils are again dominated by sodium cations with electrical conductivity (EC) more than 4 dSm-1, but the dominant anions are usually soluble chloride and sulphate. Exchangeable Sodium Percentage (ESP < 15) and pH values of these soils are much lower than in sodic soils. -->Widely distributed in arid and semi arid regions. Sodic soils have high concentrations of free carbonate and bicarbonate and excess of sodium on the exchangeable site of clay particles. They are deficient in nitrogen, phosphorus and zinc. Such soils have high pH (greater than 8.5 and sometimes up to 10.7) with a high ESP (> 15) and poor soil structure. 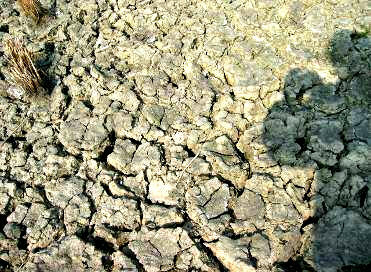 Clay fraction and organic matter are dispersed, thus soils are sticky when wet and hard when dry. There's very poor hydraulic conductivity and high impedance to root growth. 2. What are the options to fight salt related problems? 2. Select the crop and/or change genetic architecture of the plant so that it could be grown in such areas. The first approach involves major engineering and soil amelioration process which need lot of resources are often out of the reach of small and marginal farmers. The second approach i.e. breeding crop varieties with in-built salt tolerance is realized as the most promising, less resource consuming /economical and socially acceptable approach. So the ability of the plant to tolerate the salt stress up to an extent is of paramount importance to mange the resources optimally and this is the reason to develop the tailored crops with higher salt tolerance suited to salt stress environments. There is a third approach as well which can be termed as hybrid approach as it is the combination of both environment modifying and biological approach. It is highly productive, less resource consuming and economically viable approach. Nowadays major soil reclamation programmes involve both biological and hybrid approaches to combat the salt problem. 3. What is needed for the development of salt tolerant cultivars? Existence of genetic variability for salt tolerance within species is of paramount importance in crop improvement programme. Therefore choice of germplasm in breeding programme is most crucial as the success lies on it. Extensive germplasm collection provides a useful source of genetic diversity for the studied traits. Before designing any ideal plant type, it is crucial to define the soil and agroclimatic conditions of the target areas for which they are to be developed. Genotypes which are suitable for coastal areas may or may not be fit for sodic soils or inland saline soils and vice-versa. Therefore exact site characterization is an important aspect to meet the objective(s). Ideally germplasm should differ as much as possible for the traits to be improved or introgressed. Other traits should not vary too much otherwise keeping all the desirable traits into one superior agronomic background become very difficult. Reliable and repeatable screening techniques are the mainstay of any successful breeding programme specifically for biotic or abiotic stress breeding. Though screening techniques vary with crop species, growth stage and type of stress imposed but ideally it should be rapid, reproducible, easy and affordable. 4. How does salt stress show on plants? Degree of salt stress can affect the different crops differently. Extreme high salt stress conditions kills the plant but the moderate to low salt stress affect the plant growth rate and thereby manifest symptoms which could be associated with morphological, physiological or biochemical alterations. Most of the parameters like low tillering, spikelet sterility, less florets per panicle, low 1000 grain weight and leaf scorching, are affected uniformly under both sodicity and salinity, however it is not a thumb rule. It is observed that crop varieties and breeding lines do differ for their inherent capability to modify various physiological and biochemical processes in response to the salt stress. Though numerous physiological and biochemical changes take place under altered stress environment but only few of them change very significantly and also contribute a lot to the salt tolerance mechanism. These changes control the solute and water balance and their distribution on whole plant and tissue basis. Based on the studies it was observed that most of the crop plants and varieties encounters following physiological and biochemical manifestation under higher salt stress conditions. Most of the crop plants are relatively sensitive at early seedling and flowering stage. Rice, being transplanted crop, can alleviate the salt stresses at seedling stage by management i.e. transplanting of aged seedlings but cannot avoid stress at flowering stage. However, under coastal saline conditions salinity sometime increase near the terminal growth stage of the plant. In that case, plants mature fast to complete their life cycle. It is a typical case avoidance rather than tolerance but it works as far as the productivity is concerned. The false signals due to avoidance should be carefully separated out from the actual tolerance. Rice cultivars differ substantially in their growth rate with the most vigorous lines being the traditional varieties. Dwarfing genes were incorporated in most of the modern varieties and breeding lines, to increase harvest index and reduce logging. Naturally occurring salt resistant varieties invariably belong to these traditional tall varieties. The high vigor of land races may enable them to tolerate growth reduction. Vigorous growth also have a dilution effect. Tall traditional salt tolerant land races may have similar net transport of Na+ through their roots as semi dwarf susceptible lines but have much lower shoot Na+ concentration. 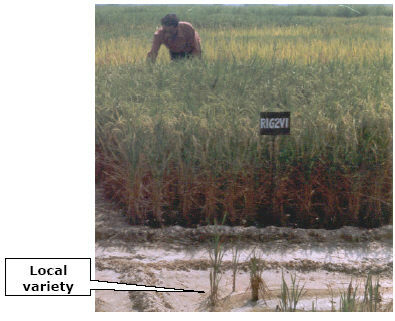 Differences in vigor among rice cultivars accounted for much of the variation in survival under high salinity. However, vigorous growth has been selected against in developing modern varieties because of the low yield potential associated with tallness and susceptibility to lodging with high inputs. However, early seedling vigor is desirable due to high sensitivity during this stage coupled with high salinity levels encountered at the beginning of the season. Plants roots experience the salt stress when Na+ and Cl- along with other cations are present in the soils in varying concentration (1 to 150 mM � for glycophytes; more for halophytes). Ion uptake depends upon the plant growth stage, genotype, temperature, relative humidity and also light intensity. Excessive amount of salt in the rhizosphere retards the plant growth, limits yield and even cause the plant death. The toxic ions sneak into the plant along with the water stream which moves from soil to the vascular system of the root by different pathways like symplastic and apoplastic. In symplastic pathway, water goes in the roots through plasma membranes of epidermis and then moves cell to cell through plasmodesmeta until offloading to the xylem. In apoplastic pathway, water moves through intracellular spaces to unload the salt in xylem. Differential osmotic potential is the driving force of energy driven pathways i.e. symplastic, while apoplastic is a non-energy driven pathway. So based on osmotic potential, plant can check the toxic ions like Na+ to enter into the cell through energy driven pathway. Na+ and K+ are mediated by different transporter which is clearly demonstrated by Garciadebleas et al. (2003). They used Ba2+ which inhibits Na+ uptake but not K+ uptake in rice roots to demonstrate the differential transport pathways. Substantial genetic variability in the rate of sodium uptake by rice roots is present signifying a sizeable potential for genetic improvement. 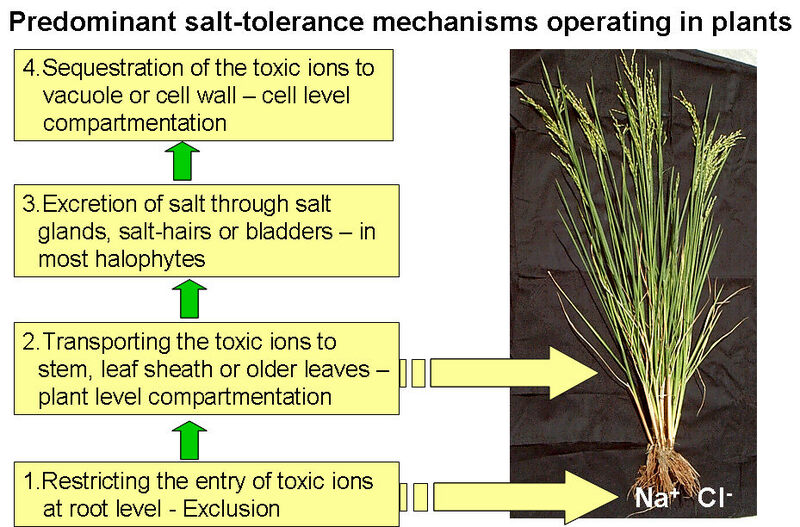 A number of mechanisms are reported to affect the salt tolerance in plants based on cell level tolerance. Ion homeostasis in cell is taken care of by the ions pumps like antiporters, symporters and carrier proteins on membranes (plasma membrane or tonoplast membrane). Salt Overly Sensitive (SOS) regulatory pathway is one good example of ion homeostasis. This pathway is activated after the receptor perceives the salt stress to alter protein activity and gene transcription by signaling intermediate compounds. One of its example is, three salt-overly sensitive mutants (sos) which are hypersensitive to specific salt NaCl (rather than osmotic effect as they are not sensitive to mannitol). SOS1, SOS2 and SOS3 mutants exhibits different phenotype with reference to Na+ accumulation. SOS3 is calcium binding protein which directly interacts and activate SOS2, serine / threonine protein kinase (Liu and Zhu, 1998; Ishitani et al., 2000 and Halfter et al., 2000). SOS3 inducts SOS2 on the plasma membrane, where SOS3-SOS2 complex protein kinase complex phosphorylates SOS1 to stimulate the Na+/H+ antiporter activity of Arabidopsis thaliana (AtNHX1) (Qui et al., 2002; Quintero et al. 2002; Guo et al., 2004). Na+ which enters leaf cells, is pumped into vacuole before it reaches to toxic level for enzymatic activities. This pumping activity is controlled by valuolar Na+/H+ antiporters (Blumwald et al., 2000). Addition of salt induce the Na+/H+ antiporter activity but it increases more in salt tolerant than salt sensitive species (Staal et al., 1991). This mechanism has been emphasized by certain experiments where over- expressing of vacuolar transporter (NHX1) has increased the salinity tolerance of Arabidopsis (Apse et al., 1991), Tomato (Zhang and Blumwald, 2001), Brassica napus (Zhang et al., 2001) and rice (Fukuda et al., 2004). This increase uptake of Na+ to short vacuoles could facilitate enhanced storage of Na+ and ultimately conferring greater tolerance by reducing Na+ in cytosol. Most of the plants, bacteria and many other organisms accumulate certain organic solutes such as sugar, alcohol proline, quarternary ammonium compounds in response of osmotic stress hence they are called osmoprotectants and also termed as compatible solutes because even in high concentration they do not interfere with enzymatic activities (Johnson et al., 1968). These are localized in cytoplasm and the inorganic ions such as Na+ and Cl- are preferentially sequestered into vacuole, thus leads to the turgor maintenance for the cell under osmotic stress (Flowers et al., 1977; Bohnert et al., 1995). Though osmoprotectant enable plants to tolerate more salinity but still a significant amount of Na+ needs to be compartmentalized for better tolerance. Therefore, it is desirable that overproduction of osmoprotectant is governed by the pleiotropic control of vacuolar Na+/H+ antiporter activity. Trehlose, a non-reducing sugar, possess a unique feature of reversible water storage capacity to protect biological molecules from desiccation damages. Recently there has been growing interest of utilization of trehlose metabolism to ameliorate the effects of abiotic stresses. Garg et al. (2002) have demonstrated the expression of trehlose biosynthesis conferred the tolerance to multiple abiotic stress. The increase in trehlose levels in transgenic rice lines of Pusa basmati 1 using either tissue specific or stress dependent promoter, resulted into the higher capacity for photosynthesis and concomitant decrease in the extent of photo-oxidative damage during salt drought and low temperature stresses. Another mechanism act in response to stress is known as transcription factor. Indeed transcription factor bind to specific sequence of the promoter regions of target genes which needs to be activated collectively or sequentially in response of stress (drought, salinity or temperature). These promoter regions include dehydration-responsive elements (DRE�s) and ABA responsive elements (ABRE�s) which are involved in the plant responses to the osmotic effect. The transcription factor DREB1A specifically interacts with DRE and induces the expression of stress tolerance genes. Constitutive over-expression of source of the genes encoding for these protein can induce the constitutive expression of many genes resulting into increased tolerance but it associated with reduced growth even under unstressed condition. DREB1A activated at least 12 genes in Arabidopsis (Seiki et al., 2001) but caused dwarfism of the plants. Hence, the stress inducible promoters (rd29A) are preferred to have normal plants showing enhance stress tolerance (Shinozaki and Yamaguchi-Shinozaki, 2000). Plants produce many kinds of stress responsive proteins induced by various kind of stresses like heat, cold, salt or drought etc. Major one of them is like LEA and dehydrins etc. (Baker et al., 1988; Bray 1997 and Dure, 1992). These are reported to play an important protective role during desiccation/salt stress in rice plants (Moons et al., 1995). Salt stress in plants induce higher concentration of Reactive Oxygen Species (ROS)/intermediate such as superoxide, H2O2 and hydroxy-radicals due to the impaired election transport processes in chloroplast, mitochondria and photorespiration pathway. Under normal growth conditions, the production of ROS in cell in as low as 240�MS-1 superoxide and the steady state level of H2O2 in chloroplast is 0.5�M (Mittler, 2002; Polle 2001). However, under salinity, the level of ROS production reaches to as high as 720�MS-1 (3 fold) and H2O2level as high as 15�M (30 fold). It is reported that H2O2 concentration of 10�M reduces the net photosynthesis rate by 50%. Superoxide and H2O2 toxicity have been attributed to the cascade reactions that result into the production of hydroxyl radicals and other destructive species like lipid peroxidases. Indeed hydroxyl radicals are very reactive and can damage vital macromolecules by protein denaturation, mutation and peroxidation of lipids. Plants have devised different system for scavenging of ROS by using the detoxifying enzymes like SOD peroxidases, catalases and antioxidants like ascorbate and reduced glutathione. 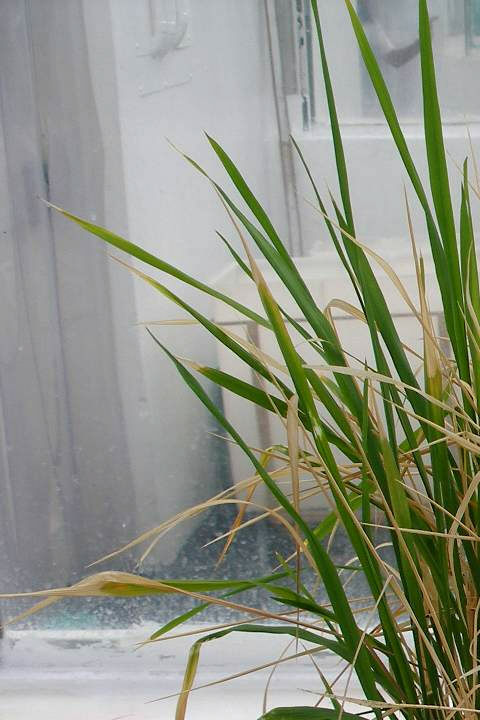 There is variability among rice genotypes for the enzymatic and non-enzymatic scavenging system hence it is possible to tag the genes coding for both enzymatic and non-enzymatic ROS scavenging agents and use them in engineering the desired plants of MAB. Plant level compartmentation is the most important mechanism conferring the salt tolerance. Plant, as an intelligent entity, transport the toxic ions to the older leaves and leaf sheaths which are ready to sacrifice for early senescence and/or death at the cost of saving young growing meristematic tissues. The ability of rice cultivars to compartmentalize ions in older leaves and structural tissues could crucially affect plant survival. Maintaining younger leaves at low salt concentrations probably contributes to the ability of certain varieties to survive saline conditions if they maintain their rates of leaf initiation at least equal to rates of leaf death. Rice cultivars differ in their ability to maintain the younger leaves at low sodium concentrations. Selection of plants on the bases of shoot appearance and /or whole shoot sodium content may not always reflect resistance in genotypes where this mechanism plays a major role in their salt tolerance. Ultimate aim of any crop plant is to undergo life cycle which completes with reproductive stage and maturity. Most of the crop plants are very sensitive to salt stresses specifically during reproductive stage, hence plant try to avoid transport the toxic ions to the flowering tissues. However there is difference in capacity to check the Na+ to the reproductive tissues among the varieties. Salt tolerant cultivars maintain substantially lower salt concentration in the panicle and with concentration being lowest in grains compared to husks and rachis. Flag leaf health is also critical for higher yield under salt stress. Tolerant lines tend to maintain lower concentration of salt in the flag leaf. Selection for healthier flag leaf at flowering could be used to screen for salinity tolerance at reproductive stage. 6. What are the screening criteria? Though there is no single definite morphological marker available for salt tolerance or sensitivity in any crop, but a combination of criteria give a good indication toward the salt response of crop plants. Therefore, several parameters are used in combination for the effective and reproducible screening. Germination percentage, coleoptile and radicle length under varying degree of salt stress for different crops is a good salt tolerance indicator at initial stages. Higher salt concentration delays or reduces the germination. It is mainly limited to the seedling studies; however, in some of the adult plant studies it has also been considered. Under moderate stress, plant survival is not a problem but under higher stress, it is a good selection criterion. Individual plant or group of genotypes are scored usually on 1 to 5 or 1 to 9 scale where lower score towards 1 states tolerant and higher score denotes sensitive genotypes. In rice IRRI�s (1988) Standard Evaluation System for salinity, sodicity and Singh et al. (2002) technique for sodicity on 1-9 scale is followed. Excessive tip burning especially in younger leaves, spikelet sterility and stunted growth are considered for the overall phenotypic expression of the genotype under stress environment. In the absence of any simple and reliable selection criteria, the 50% reduction in grain yield of the genotypes under salt stress in relation to the normal (non-stress) yield has been considered as critical limit for selection/rejection of the genotypes. The genotype with high mean, near to unit regression value (bi) and uniformity of regression (Sdi2) under multiple stress environments are adjudged as suitable, stable and adaptable genotypes for sustainable productivity in problem soils. Selection for high mean yield is a fundamental selection criterion for all the varieties while selection based on unit regression value and least deviation from regression indicates the stable performance across a range of environments (Singh and Mishra, 1997). It is a product of Stress Resistance Index (SRI) and Response Index (RI) of the genotype. Here SRI is the performance of a genotype for that trait averaged over all the stress environment in conjunction with performance under corresponding non-stress environment and RI is the mean of the genotype for the trait under all the stress environments divided by the mean performance of all the genotypes over all the stress locations (Rana, 1986). Beside yield, it has been used for germination, seedling screening, grains per panicle, ear bearing tillers /m2 and many more traits for the screening of the genotypes. Extremely high salt concentration kills the plant but the moderate salt stress exhibits the growth differences among the crop varieties. The tolerance to salt stresses is complex phenomena because it may require the combination of different independent and/or interdependent mechanisms and pathways. A tolerant genotype can be expected to have more than one adaptation. In general, tolerance of a crop variety was found to be associated with its ability to restrict potentially toxic ion uptake like Na+ and associated with preferential uptake of the balancing ion like K+. It is like an adaptation for the survival of plants so that the vital metabolic activities are not hampered. There are larger differences in ion (Na+ and K+) uptake between the species in comparison to the genotypic differences within a crop species. These are the most studied parameters for salt tolerance in crop plants. The tolerant varieties maintained lower Na concentrations besides maintaining K concentrations under high salt concentration. On the other hand, the sensitive rice varieties were unable to effectively prevent accumulation of Na+ as well as the depletion of K+. The success of the tolerant varieties in gaining higher fresh and dry weights at all the stages widens the differences in their Na concentrations still further by dilution. Tolerant genotypes like CSR 1 showed regulation over distribution and accumulation of Na taken up by the plants i.e. the delicate and vital organs like young and photosynthetically active leaves as well as the reproductive organs like panicles are kept relatively free of Na, beside having an assured supply of K even under higher salt concentration. No such regulation of Na and K seems to operate in case of salt sensitive genotype, which further aggravates the stress situation. Thus the differences in the distribution of ions in individual plant organs and with the age and position of these organs on plant are more important indicators of its tolerance potential than the difference in the average salt content of the plant. Although the uptake of both Na and K is entirely independent, but lower Na/K ratio is considered as desirable trait as it maintains the ion balance. Na is transported to shoot usually through apoplastic pathways (passive transport) while K transport takes place through symplastic pathway i.e through membrane / plasmalemma (active transport). Younger leaves relatively have lower Na than K as compared to the older leaves, which in turn resulted in higher Na/K ratio in case of the older leaves. Thus Na / K ratio increases steeply with salt concentration and leaf age. A tolerant variety keeps its leaves relatively free of the toxic ions besides having assured K supply. This factor along with the higher number of the leaves and higher leaf area probably, contributes to its success under high salt concentration. However this parameter is also not a universal phenomena hence could be taken as a selection criteria but with cautiously. Tissue tolerance is measured in terms of LC50 which is an analogue of LD50. Here LC50 is the concentration of sodium (in mmol g-1 ethanol-insoluble dry wt.) in the leaf tissue which causes a 50% loss of chlorophyll (Yeo and Flowers, 1983). It is taken as an indicator of metabolic damage to the tissue due to the salt load. LC50 values differ for different genotypes and not all the varieties in high tissue tolerant category were highly salinity tolerant and vice-versa. For example GR11 and IR2153-26-3-5-2 are highly tissue tolerant varieties but phenotypically they are not highly salt tolerant varieties. Similarly not all the low tissue tolerant varieties like CSR 10 are highly salt tolerant (Mishra et al., 1992). 7. What is the screening methodology? Field screening is the best way to identify the most suitable genotypes because salt tolerance is very complex phenomena but spatial variability in the field sometimes give the false positive results due to escape. Therefore extensive field testing for soil salinity gradient and blocking of the same is the best way to minimize the error chances. Long rows of 10 to 30 meters with space planting depending upon the type and generation of material minimize the effect of spatial variability. It allows maximum possible exposure of all genotypes to varying soil stress conditions. The layout for such a test is generally incomplete block design or augmented design in which a set of check varieties is replicated many times. It increases the potential number of test varieties allowing screening of large number of genotypes at the same time. It is further possible to cut across the long plots in several parts as replicate to obtain varietal performance at varying levels of soil stresses. The involvement of more number of checks have been found better in data processing and finalizing the tolerant lines. Soil heterogeneity and spatial variability hinders the reliability of the response of genotypes in true and dependable way. This attracted the development of mini-field environments with varying levels of controlled salinity and sodicity environments. These devices are series of dug-out cavity structures made of brick-mortar-concrete materials and filled with artificially prepared or natural transported problem soil. It is possible to create and maintain desired levels of sodicity and salinity in these microplots in a manner very much comparable to field conditions minus the soil heterogeneity. 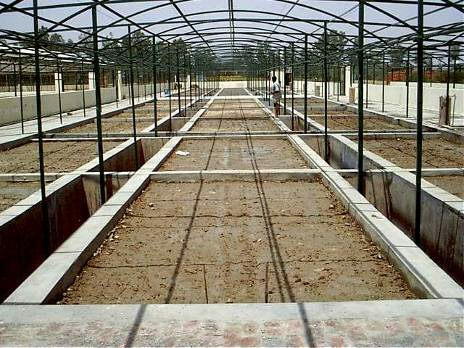 The plot size in these pits are kept very small (single row) to 2-3 rows but because of a good control over micro-environment, it is highly representative of the genotypic performance. The microplots are being used to screen mostly early segregating and also stabilised populations besides genetic studies. For more precise study of the individual plant response under a constant stress, round porcelain pots of 20 or 30 cm diameter, with a capacity of 8 or 16 kg soil with a provision to allow or plug off leaching from bottom, are used. Pot studies also allow for periodic uprooting of plants at a given growth stage for specific studies associated with age of plant. The edaphic environment of the pots is more or less uniform throughout the growth period of plant in respect of degree of stress. The genetics for salt tolerance is being studied in pots. Sand and soil cultures are being used in the pots for the controlled studies. For details, please refer the screening manual by Glenn et al. (1997). See below. The solution culture screening setup requires styrofoam seedling floats. These floats can be easily fabricated of various sizes however a rectangular styrofoam of size 28 x 32 x 1.25 cm having 100 holes (10 x 10) with nylon net bottom is preferred. The float with frame can be placed on the top of 10-12 litre plastic tray with culture solution of desired salinity. Yoshida culture is used as the nutrient supplement medium. Approximately 3 and 6 g/l NaCl is needed to raise the salinity to 6 and 12 dSm-1 respectively. Regular maintenance of the nutrient solution is very important. Considerable attention has to be given in adjusting the pH. Monitoring and maintaining the pH of the culture solution is very critical because change of the pH alters the balance of the available nutrients. Significant deviation (�1.0) of culture solution pH from 5.0 can make a lot difference for the availability of the nutrients, thus a reliable pH meter and its regular calibration are essential. Since ammonium and nitrate are the sources of nitrogen, the pH will decrease during the first few days because ammonium ion is favorably absorbed by the plant than nitrate ion. The pH will then increase when ammonium ion is depleted and more nitrate ion is taken up by the plants. The increase of the pH in the nutrient solution could be used as an indicator that nitrogen source starts to be deficient. Change the nutrient solution every 8 d. Due to evaporation and transpiration there will be loss of solution volume in the trays which could be top- up with RO or distilled water every 2 d.
Seedling float for salinity screening at the seedling stage. Test seeds have to be heat-treated for 4 - 5 d in a convection oven set at 48�C to break seed dormancy. Proper breaking of the seed dormancy is very essential in screening as delay in germination of some entries will likely make them more sensitive to salt. Seedling vigor has great advantage at this point since salinization occur at very early seedling stage. After breaking the dormancy, surface-sterilize seeds with fungicide and rinse well with distilled water. Place sterilized seeds in petri dishes with moistened filter papers and incubate at 30�C for 48 h to germinate. Sow two pregerminated seeds per hole on the Styrofoam seedling float. The radicle should be inserted through the nylon mesh. During this process, the radicle may be damaged and this damage may not be visible. 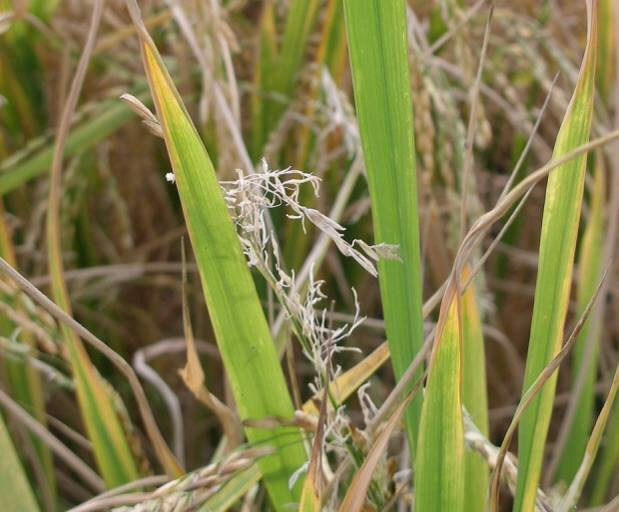 Any damage to the radicle will destroy the main salt tolerance mechanism of rice. Therefore, sufficient time should be allowed for the seedlings to repair any root damage. For this reason, pregerminated seeds should not be seeded in salinized nutrient solution. Suspend the Styrofoam seedling float on the tray filled with distilled water. There are adequate nutrients in the endosperm for the seedlings to grow normally for 3-4 d. After 3 d, when seedlings are well established, replace the distilled water with salinized nutrient solution. Initial salinity is at EC = 6 dS m-1. Three days later, increase salinity to EC = 12 dS m-1 by adding NaCl to the nutrient solution. Renew the solution every 8 d and maintain the pH at 5.0 daily. Test entries can be scored at 10 and 16 d after initial salinization. 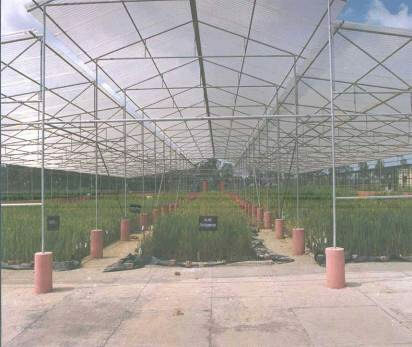 At IRRI, this test is conducted in phytotron glasshouse maintained at 34�/24�C day/night temperature and minimum relative humidity of 70% during the day. These controlled conditions minimize environmental interactions. However, ordinary glasshouses or greenhouses could also be used. The seedling float has 10 rows with 10 holes each. One row could be used for one test entry. It is essential to have check varieties in every seedling float to guide in rating the visual symptoms of salinity stress. At IRRI, we use two check varieties�IR29, sensitive and IR66946-3R-178-1-1 (FL478), tolerant ( derived from the Pokkali/IR29 cross). With these checks, 8 test entries can be screened in one seedling float on a tray. Use the modified standard evaluating score (See table) in scoring the visual symptoms of salt toxicity. This scoring discriminates the susceptible from the tolerant and the moderately tolerant genotypes. Scoring may start at 10 d after salinization and final scoring at 16 d after salinization. At 10 d after salinization, IR66946-3R-178-1-1 scores 1 and IR29: 7 or 9. After 16 d salinization IR66946-3R-178-1-1 scores: 3 and IR29; 9. By this time, there will be a clear distinction among the test entries: the tolerants, moderates, and the susceptibles. Table: Modified standard evaluation score (SES) of visual salt injury at seedling stage. The complete protocol for the seedling and adult plant screening is given in the Screening manual from IRRI. Please click on the icon to open this manual in PDF format. Click on the arrow to see the next step. 8. What is the breeding methodology? Modified bulk pedigree method: Individual F2 plant harvest is bulked up to F4 or F5 generation followed by panicle selection and handling the population as in pedigree method. The segregating materials are put in the long rows under salt stress with space planting in F2 particularly. Selection pressure is gradually increased with the generation advancement simultaneously in moderate stress and high stress of sodicity and salinity. The recombination strategy includes the i) grouping of the genotypes based on the predominant inherent physiological mechanism responsible for salinity tolerance, ii) inter-mating of the genotypes with high degree of expression of the contrasting salinity tolerance mechanism, and iii) identifying / screening of the recombinants for pooling of the mechanisms to enhance the further level of salt tolerance. Pokkali type of rice varieties are highly salt-tolerant and commonly grows in coastal areas of Kerala State, India. It is a traditional, tall, susceptible to lodging, photoperiod-sensitive rice variety with low tillering and long, broad, dark, and droopy leaves. It has red pericarp and poor grain quality. It is highly tolerant of salinity but yielding ability is low. Pokkali was subjected to cell culture for induction of somaclonal variation. Somaclonal variants of Pokkali with improved agronomic traits were identified. The variant isolated (TCCP 266-2-49-B-B-3) had desirable levels of all the characteristics tested. Its level of tolerance for salinity remains as high as the donor. It has vigorous growth and, unlike the parent Pokkali, is semi-dwarf, a trait essential in increasing the yield potential without lodging. The variant had white pericarp which is a distinct advantage. There was also improvement in cooked rice quality, with the semi-dwarf variant having medium consistency. These characteristics make the somaclonal variant TCCP 266-2-49-B-B-3 superior to Pokkali as a donor of salt tolerance in hybridization programs. It has become a popular donor parent and has produced new high-yielding salinity-tolerant lines, some of which were already released as varieties. 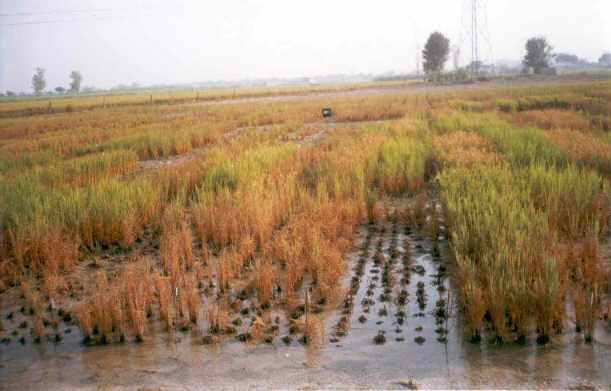 Development of a promising salinity-tolerant line through hybridization and selection procedure could take atleast 8-10 years where more than one rice crop can be taken in a year, while it takes much more time where only one crop per year is grown. This period could be substantially reduced by applying the F1 anther culture technique. 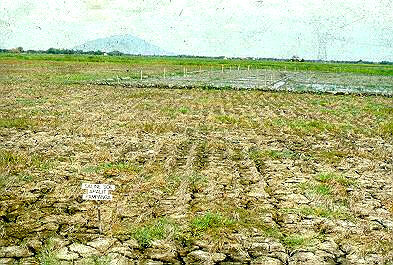 In 1996, some high-yielding salt-tolerant anther culture-derived lines were generated at IRRI. It only took 3 years for the tolerant lines to be isolated. These AC-derived lines were IR51500-AC11-1, IR51500-AC17, IR51485-AC6534-4, IR72132-AC6-1, IR69997-AC1, IR69997-AC2, IR69997-AC3, and IR69997-AC4. IR51500-AC11-1 was released as a salt-tolerant variety in the Philippines with the name PSBRc50 or �Bicol�. This is the first time for anther culture-derived lines from indica-indica cross to be released as a variety and also the first to be recommended for cultivation in adverse environments. 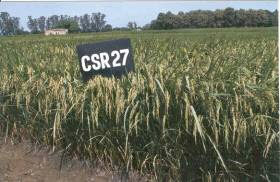 IR51500-AC17 and IR51485-AC6534-4, named CSR21 and CSR28, respectively, were also identified as tolerant rice varieties in India. DNA MAS has been seen as a means of improving the speed and efficiency of plant breeding programs because it is growth stage independent, unaffected by environment; no dominance effect and efficient to use in early generations. Most widespread use of MAS to date has done in the marker assisted backcrossing (MAB) of major genes to into already established varieties, mega-varieties (which occupies a large area within the country on across the countries) or elite cultivars. These markers could reduce the linkage around the target gene, and also recover the recurrent parent background within less number of generation in comparison to conventional breeding. 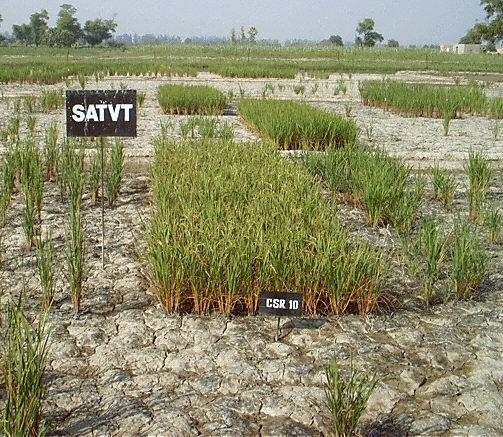 IRRI has already using marker assisted selection for saltol QTL, responsible for seedling stage salinity tolerance in rice, to facilitate the breeding for salt tolerant cultivars. fool-proof and early generation screening. Major bottlenecks of the utilisation of the MAS for salinity across the population and comparing the different QTLs are the parental specificity and different screening protocols under different conditions. Some of the studies for QTL identification were undertaken without the proper selection of the contrasting parents. The available mapping populations, even if they are not the appropriate ones, were used for the studies. Beside the problem of parental specificity, phenotyping for salinity is a biggest challenge. The stress response of the genotypes depend upon the age of the seedling, stress application in terms of duration and degree. Proper screening and phenotyping for the salt tolerance under stress using a standard protocol under standard environment conditions will result into the less variable results with better repeatability. For example, the stress response of the genotypes would be different at 4, 8 and 12 dSm-1, and the differential response will depend upon the age of seedling at the time of treatment, atmospheric temperature and RH conditions (Singh et al, 2005). Therefore the standard protocols should be followed for phenotyping to get the reliable and repeatable inferences. 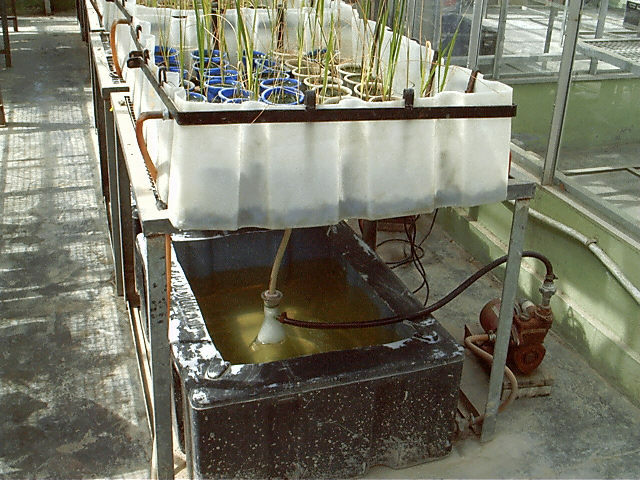 Major research program on MAS at International Rice Research Institute (IRRI) are concentrated on introgressing Sub1 and Saltol QTLs for submergence and salinity tolerance respectively into the improved germplasm or adapted varieties. The major QTL for salinity tolerance i.e. Saltol is being transferred to the improved background as well as adapted rice varieties. Saltol located on chromosome 1, is linked with SSR markers like RM 8094, RM 493 and RM 3412 . However, these markers are population specific which limits the scope of the MAS application across the diverse material. Flowers et al. (2000), while reporting the putative AFLP markers for ion transport and selectivity for salinity tolerance from a custom made mapping population of rice, also cautioned against any expectation of general applicability of markers for these physiological traits. Genetic studies indicated the predominance of both additive and dominance effects for almost all characters associated with salt tolerance (Mishra et al., 1990; Gregorio and Senadhira, 1993; and Lee, 1995). At the seedling stage, characters such as shoot length, Na+ and K+ content in the shoots, and dry weights of shoots and roots showed significant and high magnitude of additive effects. These high predictable values may be used as criteria for selection of salt tolerant lines at the seedling stage. However, the estimates of heritability in these characters were low. Characters at maturing stage such as plant height and yield per plant showed significantly high magnitude of additive effects, suggesting the greater importance of additive gene action in the inheritance of these characters (Moeljopawiro and Ikehashi, 1981; Akbar et al., 1986; Mishra et al., 1990). Narayanan et al. (1990) reported the non-significance of additive effects for grain yield per plant under normal conditions from a 6x6 diallel study. Under saline stress condition, the additive effects became highly significant. Gregorio and Senadhira (1993) used a 9-parent complete diallel. Results showed that salinity tolerance (low Na-K ratio in the shoot) is governed by both additive and dominance gene effects. The trait exhibited overdominance and is controlled by at least two groups of genes that exhibit dominance. Environmental effects were large and the narrow-sense heritability was low (19.18%). They suggested that breeding population must be large and selection for tolerance must be done in a later generation and under controlled conditions to minimize environmental effects. These findings suggest that 1) early-generation breeding populations must be large and replicated and 2) selection for tolerance must be done in a later generation and under controlled conditions to minimize environmental effects. An inheritance study was conducted under sodic soils using F1 and bulked F3 generation of 3 crosses between two tolerant parent (CSR10 and CSR11) and two sensitive parents (Basmati 370 and Pakistani basmati) under artificially created sodic soils (pH 9.8) in lysimeters. All the F3 plants, scored based on IRRI scoring method at adult stage, showed continuous variation suggesting that sodicity tolerance is controlled by polygenes (Singh et al., 2001). A similar inheritance study for salinity was conducted involving same populations. Results indicated the role of few major genes alongwith numerous minor genes involved for salinity tolerance. It was also inferred that salinity tolerance trait is polygenic in nature and lacks maternal influence (Mishra et al., 1998). 10. What is the impact of the IRRI programme? A long chain of introduction, selection and recombination processes led to the development of improved salt tolerant materials which directly benefited the farmers by increasing their harvest in salt affected lands. Increased food production in fields with low or zero productivity not only improved economy and well being of the poor farmers / owners of the land but also increased the employment avenues to the local people during the crop season in addition to the improved status of the state�s and country�s granaries. In other countries also many salt tolerant rice varieties have been released for commercial cultivation like CSR10, CSR13, CSR23, CSR27, CSR30, CSR36 and Lunishree, Vytilla 1, Vytilla 2, Vytilla 3, Vytilla 4, Panvel 1, Panvel 2, Sumati, Usar dhan 1, 2 & 3 (from India); BRRI dhan 40, BRRI dhan 41 (from Bangladesh); and OM2717, OM2517, OM3242 (from Vietnam). Click here to see the references used in this lesson. In the next lesson, you will learn about another stress: Submergence.